In CCI, alongside co-counselling, we have Here and Now Groups: I have been going to these groups for 20 years, both inside and outside the CCI network, and continue to be enthusiastic about how the situation provides me with the opportunity to be surprised, to get to know myself, to relate instead of switching off, and to connect with myself and others authentically and in unexpected ways. Stay in the here and now, to stay present, and notice your thoughts and feelings. Try to avoid talking about ‘there and then’. This is an exploratory group with no fixed agenda: allow space for the unexpected. Experience a group of equals where there is no leader to show you what to do: the group is peer-led. It’s not a discussion space for ideas about the world or about other people, it’s about “what is”: it’s about “being”. Group meetings have a beginning and an end time, plus time for a break, but other than that have no structure, so as to allow an open space for the participants to use as they wish: there is no set task or division of roles. The experience is both interpersonal and intra-personal. This means that there is an element of relating to others in the group, so it is inter-active, but it also provides an opportunity for internal reflection, about how you are, in any one moment. At times there may be silence in the group broken only when someone feels moved to speak. 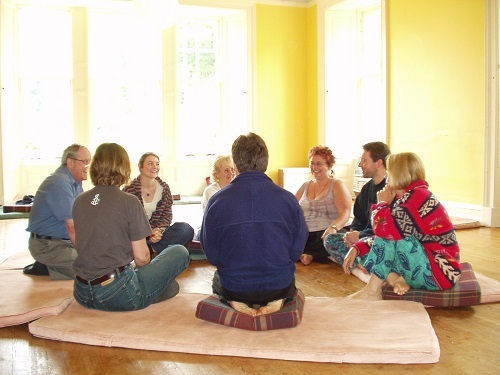 Here and now groups are different to but complementary to co-counselling. At the CCI network residential events (there are about 12 per year in the UK which you may optionally attend) we primarily do workshops that are straightforward co-counselling, which follow the basic method that we have been using for decades, and that you can learn by doing the course advertised on this site. However, alongside this, we often have at least a couple of workshop spaces at each residential dedicated to the Here and Now Group structure. I also put on Here and Now groups in Leeds. and you are responsible for your own wellbeing. The group is not suitable for people who are very emotionally fragile or disturbed, nor for anyone whose life is in chaos. It should be fine for you as long as you welcome the opportunity to reflect on how you are in the present moment, and can tolerate the fact that we won’t know what will be said. Whilst it may help you if you have had some experience of group-work, this is not essential.